This week, Conair Corporation and Keurig, Inc. announced that they are entering into a licensing and distribution agreement for a new line of single-cup coffeemakers. But not Keurig coffeemakers. Instead, the two companies have procured the rights to distribute the products using the Cuisinart brand. Fortunately at this point, that's as confusing as it gets (even though one normally thinks of Conair as manufacturing hairdryers instead of kitchen appliances). But all companies involved in the process are excited about the collaboration. Cuisinart is currently the top seller of coffeemakers in both department store and TV home-specialty sales figures -- so the excitement isn't too hard to understand. The products will actually be co-branded Cuisinart and Keurig, but will be compatible with the patented K-Cups that Keurig has previously manufactured for coffee, tea, and hot chocolate. This is a crucial reason for the partnership, actually. The marketing campaign to come will intend to see more K-Cup coffeemakers replacing the generic, multi-cup models that consumers are so used to. 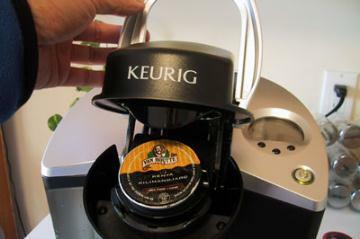 John Whoriskey, Vice President and General Manager of Keurig's At Home Division, confirmed the motive by saying, "We believe that having Cuisinart develop, market, and sell a co-branded brewer using Keurig's K-Cup technology platform will help speed the adoption of single-cup brewing into homes in the United States and Canada. Consumers will now have more brands and models from which to choose as the number of coffeemakers utilizing Keurig's technology platform expands." The collaborative product launch is currently scheduled for the spring of 2010.